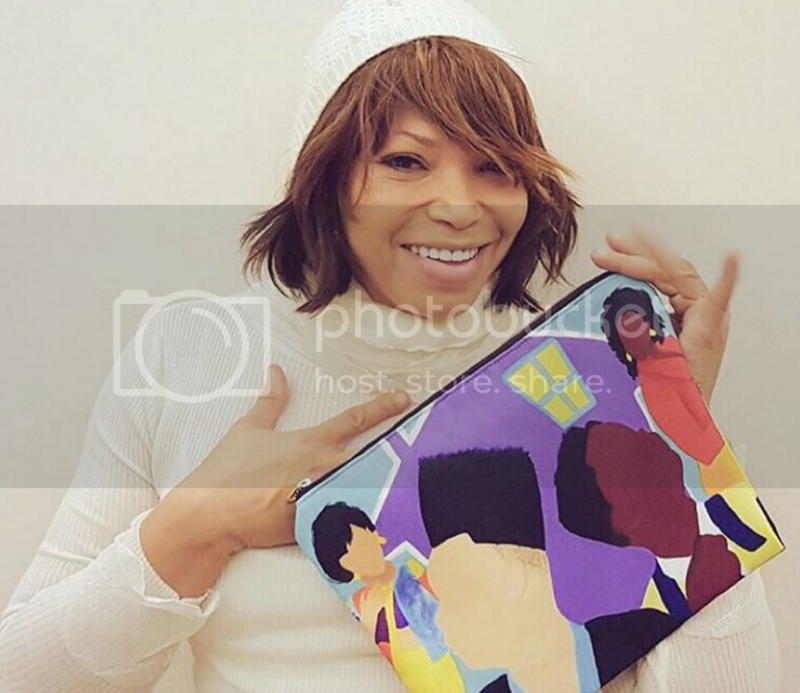 Have you seen this dope-90’s feel clutch adorned with outlines of Joan, Maya, Lynn and Toni from girlfriends? Yes! It pretty much went viral and I had an opportunity to connect with the 26 year old artist-anthropologist behind the design. Kashmir Thompson is her name and she’s reinventing the way we celebrate black pop culture with beautifully crafted regalia. In less than 2 years Kashmir has grasped the attention of Tisha Campbell, Angela Bassett and most recently Essence Magazine. So of course we had to meet the namesake of KashmirViii, check out the interview below! Q: Your bio said you’ve always been interested in art, what caused you to pursue it full time in 2014? A: In 2014 I found a lot of my old artwork at my mom’s house and I said to myself, 'I really need to start painting again.' So for my birthday I asked all of my friends to buy me art supplies or gift cards to art stores as my birthday gift and they did just that. I got some supplies and started drawing and painting again, mostly just for fun until I moved to Atlanta at the end of 2014. In the midst of looking for a job I started painting more so that I could sell my art as a way to make money. Early 2015 things kind of just took off and I stopped looking for a job! Q: What are your favorite products to design? A: My favorite things are definitely the clutches! I just think they're so different and fashionable. Not to toot my own horn but, a fashion accessory based off of all your favorite black pop culture icons? Like, that's genius to me. Not to mention my super vibrant and saturated style just looks really good on canvas and truly adds a gorgeous pop to any outfit! A: It's EXTREMELY important to me. It's crazy that in 2016 colorism is still extremely prevalent. I never want to be the person that only caters to and showcases "light skinned" women because they have been seen as the ideal "beautiful" when black women are concerned. At the same time, I don't want to be the person who only showcases and caters to dark skinned women in an attempt to give them more shine, since it seems like we're always the ones left out. A black woman is a black woman. My blood sister is at least 4 foundation shades lighter than me. She's not less of a black woman than me, and I'm not more of a black woman than her. We are all equal and in this together. It is so IMPERATIVE that women of ALL shades can find themselves in my art and relate to it. I try my very best to match skin tones as close as I can. It's very important to me. Q: How easy is it for you to create controversial art like "...And the Home of the..." Super Graphic Tee? A: With all that's going on today, it's super easy for me to create it. Unfortunately, there's so much inspiration in that particular category. At the same time, it's hard for me because I never want to exploit the good fight. I never want to paint specific people or use actual cases as the basis for any of my paintings because If I decide to sell it, I don't want to seem like I'm doing it to profit off of a specific person/tragedy. That's really wack to me! Someone asked me to paint Trayvon Martin so I could sell prints and that's almost really rude to me. Unless the proceeds are going directly to some type of cause, I don't want to be the one capitalizing off of that, you know? So while it's easy inspiration wise, that's about where it stops. Q: How would you define Bloomin', as used to describe your recent canvas and notebook products? A: Bloomin was inspired by an artist by the name of Loza Maleombho. She takes these amazing photographs of herself and then digitally transforms them into craaaaazy pieces. A pic of her flew across my timeline one day and I was blown away by her beauty. I found out who she was, asked for her blessing to paint it and went to town. No super deep meanings or anything, just really loving and appreciating the beauty and art of a fellow sister. Q: You seem to have a few pieces dedicated to Grace Jones, what about her inspires you? A: Grace Jones is PERFECT. She exudes such confidence and beauty. She's such an amazing walking contradiction. She's graceful, poised, and has a sort of very delicate beauty about her. But at the same time she's extremely brash and in your face. She's so sure of herself and she knows it and wants to make sure you know too. I just love it! Q: What made you create a self-titled brand? What about your products resonates with your name? A: Everything about everything I make is me. Not literally of course, but I never paint anything that doesn't resonate with me, who I am and what made me the person I am. Every movie or show or artist that I paint has meaning to me. It takes me back to a particular time, place, day or exact moment that somehow shaped me into me. Q: What did it mean for you to be featured in Essence Magazine? A: My Essence magazine feature was so important to me. To get a look that big with a name that everybody knows was like 'Okay...I'm doing something right. Now KEEP GOING.' It's something that I'm able to show to my family who worries about me back in Ohio. It's like 'Hey look, I'm doing exactly what I told you I would do...and here's proof i'm okay.' The thing that made it even more special for me, is the issue they decided to feature me in. The #BlackGirlMagic issue? During Black History month? In one of the top premiere print magazines catering to women like me? That's HUGE. That's literally a part of history that I can have with me forever. No one can take that away from me. A: Success to me is happiness. No matter what you're doing for a living, or how much money you make, or what you drive or where you live...if you are happy, like genuinely happy, then you are successful to me. If I have $5 million in my bank account and I'm driving a Benz, wearing a fur coat while being the saddest person alive...what does it even mean? So many people define success with money and it doesn't work like that for me. Q: What do you hope 2016 will look like for Kashmir.Viii? A: I'm hoping for all I achieved in 2015 plus more. I want to touch more people, reach more lives, decorate more homes and generate more smiles. I’ll be smiling myself, once I get my hands on the #yousocraaaazy clutch! follow @KashmirViii on Instagram and check out kashmirviii.com!